- Harvest Overhaul patch: is this still needed when using CACO. Since CACO includes HO and requires your Flora Fixes mod, I guess not? - SMIM patch: is it still needed? SMIM (in it's current state) doesn't offer any "Rabbit sub-package" that I know of. However, your Flora Fixes mod itself does overwrite 2 SMIM hangingrabbit meshes. Oh, these hanging rabbits... I've had some ridiculous problems because of this mod's rabbits and SMIM. Had to waste a lot of time re-installing all my mods, before figuring out what caused the problem. Has anyone run PDT and seen how much this mod thrashes Papyrus? Just want to know whether it is safe to uninstall. 3 year old, no update, script intensive mods I have found to be problematic to say the least. Not safe to uninstall during a playthrough. Need to start new game. The mod has always worked fine for me, no matter how intensive it might run. Yeah I've noticed the same. This is most script-heavy mod I have. Looks like it causes delayed harvest sounds. It crashes my damn game, I can't even run it properly. I'm a newbie, but I tried with and without your mod and it does indeed make a difference, so thank you. The "tesvTranslator" is very easy to use. You need the 15 french and the 15 english Strings for this tool. Confirming that this works with SSE if you convert the the meshes using SSE NIF Optimizer and convert the ESP using the SSE CK and Wrye Bash (you must use Wrye Bash to "ESPify" the ESP before loading into the CK, then "ESMify" the ESP after saving in the CK). I haven't expereinced any bugs/crashes as a result of using the converted mod, and I tested that flora does respawn with it installed. Just did the same process for the ESP, but only sanitized the NIFs so far (lots of unnamed NiNodes). Glad to get some confirmation that it works. Well done! Any chance your converted files are available for download? I have privately, but I'm not about to post it... because people will expect support. And I know jack :P Just enough to port it. And even then, I still somehow can't get the SMIM patch to display hanging rabbits correctly (everything else is simple enough though). This mod was published after I'd already pumped and edited FloraRespawnFix in my game way back when, so I never wanted to make the switch with the script in Respawn Fix having spread its fingers all throughout Tamriel. Could I theoretically just use the FloraSaveFixer to clean up my saves, but continue to use FloraRespawnFix? Just cleaned 1.7MB of Flora data out of my longest save file. Now that was some serious green thumbing. Edit: The answer is yes, but FloraRespawnFix, even without harvesting anything, still starts spreading its fingers again creating instances of itself. I checked this with the SaveGameScriptScalpel mod. Theres a diagnostic report after you run it on a save that's very useful. Every new save since running FloraSaveFixer but keeping FloraRespawnFix in the load order shows the number of FloraRespawnFix instances increasing. In my case, the number is way way way lower than the number of instances that were cleaned by FloraSaveFixer (~1100 vs ~32000). So I guess you could just run FloraSaveFixer every now and then to clean up FloraRespawnFix or just make the switch. Probably mid playthrough is not a good idea for either choice, but I' m not seeing a drastic good or bad so far in my save having run the SaveFixer and continued on.
" Not compatible with, and intended as a replacement for Flora Respawn Fix." The question wasn't if it's compatible; the question was what the difference is. I like this mod a lot, but it doesn't fix the respawn bug in my game for some reason. So I've switched over to using the respawn fix mod. Flora re-spawn fix only fixes future flora issues. The flora issues you have currently are permanent. But if you download Wiseman303's FloraSaveFixer and repair your save file, plus install Wiseman's303's Flora Fixes, you're problems will be resolved. Instructions to fix your save file is included with the download. 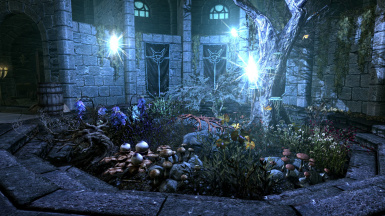 For my Skyrim setup, Flora Re-Spawn Fix works like a champ. No hiccups.